Contacting patients many different times and incentivizing patients to respond. RECOVERY 20/20™ makes between 8 and 15 attempts to contact patients for each of the three different follow-up periods - one month, six months and twelve months post-treatment. We reach out by text and email first and if the patient doesn’t quickly submit his or her survey, our wonderfully friendly specialists start calling them personally. We send clients who complete our surveys a small Starbucks or Target gift card along with a handwritten note that thanks them and reminds them when we will contact them again. And if we’re not successful reaching the client within a short period of time, our specialists will reach out to the family members or friends the patient has given us permission to talk to in an attempt to update our contact information. 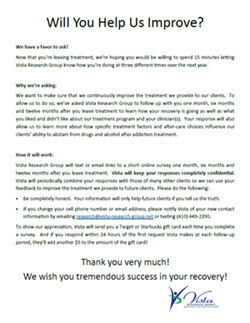 Fully implementing Vista’s progress monitoring research: Patients at centers that are effectively using INSIGHT Addiction™ to monitor patients during treatment become used to filling out our quick-and-easy online surveys. When their clinician responds to a comment they make or notices that their feelings of anxiety have increased, the patient sees first-hand the benefits they receive from progress monitoring. Additionally, many of the patients will text back and forth with our staff in response to a weekly update request, helping them to realize that there are real (& friendly!) people behind the automated requests. In fact, effective implementation of INSIGHT is so critical that Vista doesn’t offer RECOVERY 20/20 to clients who are not also using INSIGHT Addiction™ or INSIGHT Behavioral™ to monitor the progress of their patients during treatment. Telling patients that taking part will help future patients: Since the feedback a patient provides on RECOVERY 20/20 surveys is confidential and will only be reported to the treatment center in aggregated form, there’s little benefit to the patient from completing surveys once they leave treatment. However, knowing that the center will use their anonymous feedback to improve treatment for future patients can often be very motivational. To assist center staff in reminding patients about the outcomes research and stressing how important it is for them to respond, Vista has created a simple client letter to be handed to them at discharge. Making sure patients provide accurate post-treatment contact information for themselves as well as family members or friends we can contact if they are unreachable: One would think that this goes without saying, but we’ve been surprised by the number of times groups of patients have all started providing the same bogus email address, phone number and/or fake information for family members. Clearly if we don’t have their contact information, we’re not going to be able to reach them during or after they leave treatment! Providing effective treatment: Finally, the most important thing a center can do to achieve a high response rate is to provide effective treatment. Obviously, former clients will be much more motivated to report that they’ve been successful remaining sober than if they have relapsed. Because of all these factors, Vista’s success getting clients to complete follow-up surveys varies tremendously between treatment centers. Despite the fact that we’re following exactly the same protocol for each patient, our success rate in reaching patients during the first three months of launching RECOVERY 20/20 at different centers has varied between 7% and 89%! Most centers are able to achieve acceptable response rates from the beginning. In cases where this is not happening, Vista notifies the center and works with them to identify changes they can make to improve their response rate. If desired, we will relaunch RECOVERY 20/20 after a center has improved their procedures. Fortunately, this process can result in a dramatic improvement in response rates. For example, one center recently increased their response rate from 39% to 69% after implementing our suggestions! As a result of the hard work of staff in both our client centers and on our outcomes team, Vista is typically able to reach at least 60% of patients selected for follow up. Vista plans to release its first annual State of Addiction Treatment report early next year. 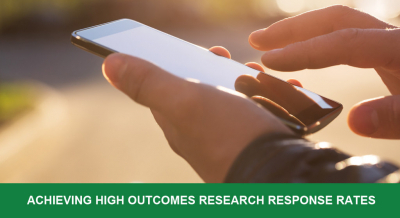 If you’re interested in being able to compare your post-treatment outcomes results to those of other leading addiction treatment centers, please contact a Vista research advisor at (800) 215-3201 x1.